Hi Polished Habitat friends! I’m so happy to be back today talking about two things near and dear to my heart – Anthropologie and budget-friendly. 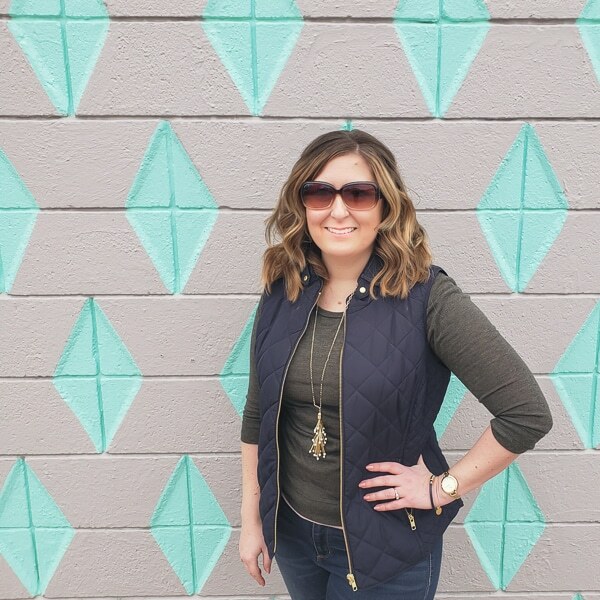 I realize that is an oxymoron in itself BUT I’m here to show you yet again that you can get the glam Anthro look for a fraction of the cost…and in this case almost 90% cheaper! Cue the applause! Now one of my all-time favorite things to do is peruse the seasonal Anthropologie catalog over a hot cup of coffee in pure silence. I ohhhh and ahhhhhh at all the pretty things and think how glamorous it would be to live in these rooms. 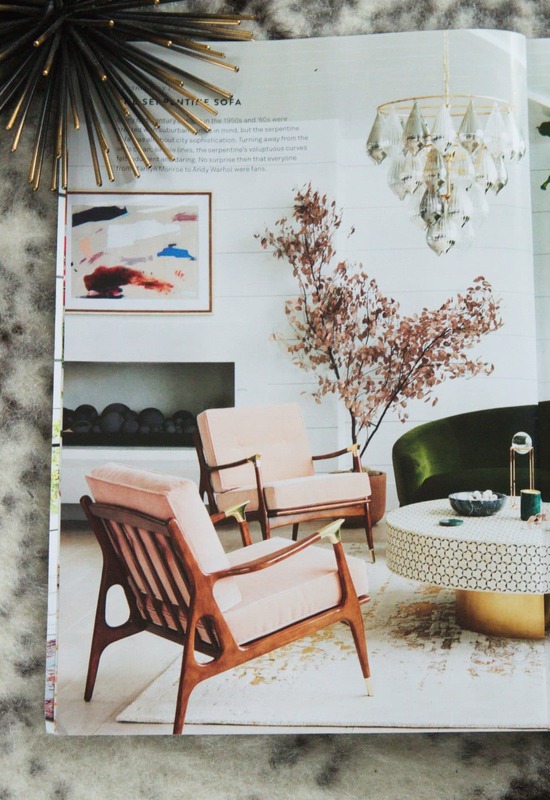 Shiny chandeliers, textured dressers, and the most heavenly rugs you ever did see grace these pages and offer endless inspiration. But if you know me by now (we’re friends by now right?!) you know I love allllll the fancy things but without the fancy price tag. 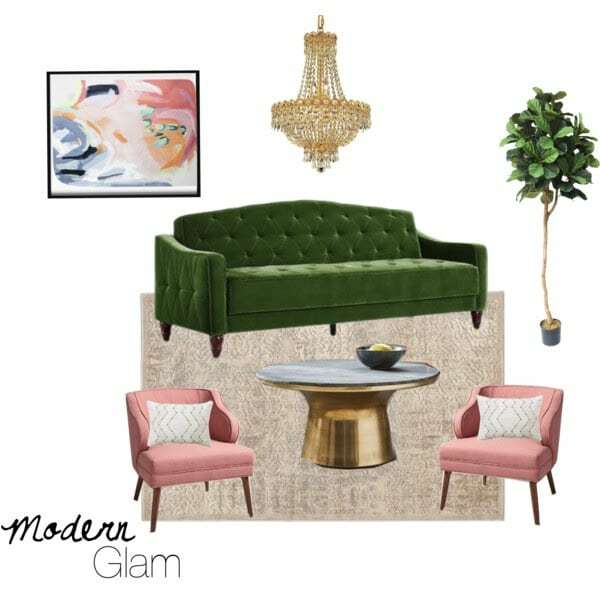 So for the Fall 2017 catalog I chose an inspiration space and re-created it for a mere fraction of the cost – I even outdid myself from the Spring 2017 high-low challenge! 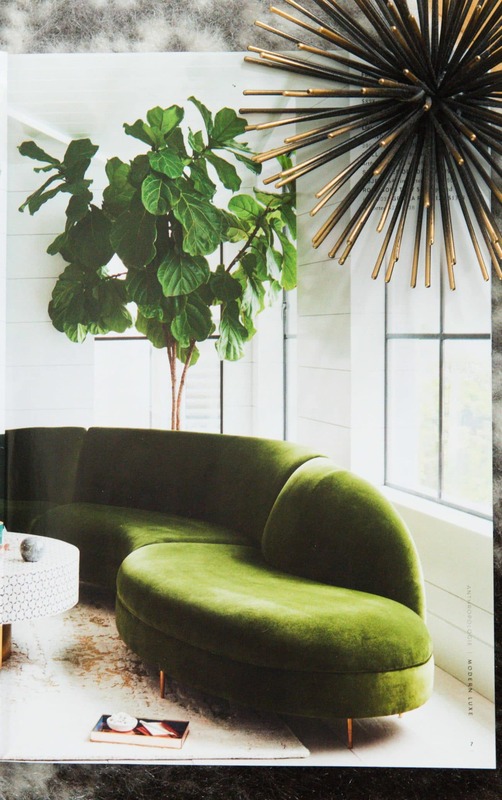 The space gives that Hollywoodd glam feel while the natural elements like the fiddle leaf fig and white walls keep the space more modern. The key pieces in this room come at a hefty price tag no doubt! 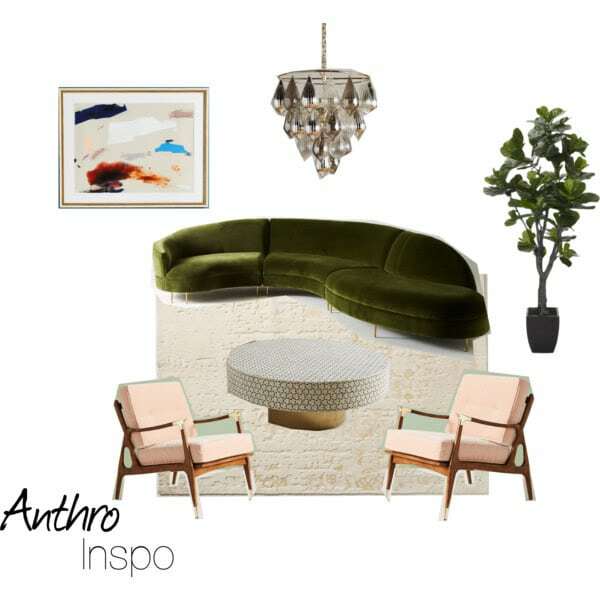 I put together a mood board as our inspiration based on the catalog space using key elements to re-create the look and feel of the room. PRICES & AVAILABILITY ARE SUBJECT TO CHANGE AT ANY TIME AND ARE GIVEN AS EXAMPLES AS OF 9/19/17 WHEN COLETTE RESEARCHED THIS POST. This puts our grand total at $12, 256! Surely we can do better than this right?! 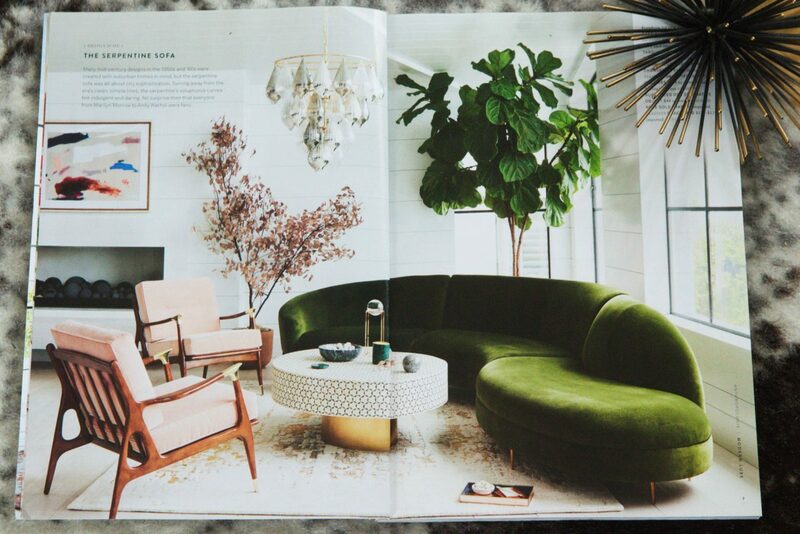 Don’t get me wrong – I absolutely adore all of these pieces and with a limitless budget I can’t say I wouldn’t snag up that green sectional (because hello gorgeous) but I’m assuming most of us are in the THAT’S AN INSANE AMOUNT OF MONEY boat. After doing a bit of online shopping I put together a very similar look for 1/10th of the cost! Grand total for our less expensive space is $1680! Who wouldn’t want that space for that price! That’s a whole lotta furniture and decor for a reasonable price. Heck – with some thrift store perusing this cost could get even lower! Let’s take a look at a side by side of our two spaces! My budget-friendly version has a bit more color to it but all in all, I think it’s pretty darn close! And – we SAVED $10, 576! With all the devastation our county has been facing with hurricanes and flooding it’s also nice to be able to use that extra money we save to help others in our community and those afar. Which room do you like best price tag aside? Are you more of a splurge or saver when it comes to key pieces in your home like a sofa/sectional? I can’t wait to hear what you think! 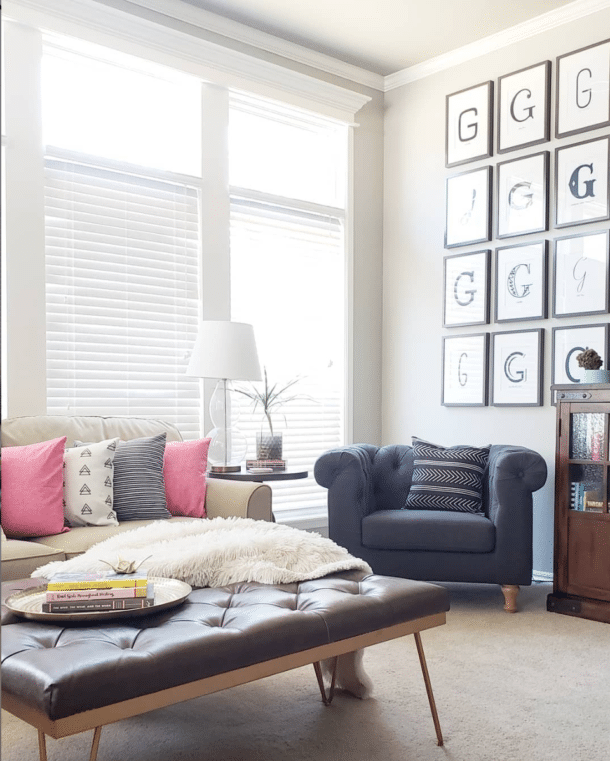 Are you more of a splurge or saver when it comes to key pieces in your home like a sofa/sectional? I can’t wait to hear what you think! That’s a gorgeous option too! Thanks for sharing! I like the sectional because of the unusual shape. However I prefer your chandelier and coffee table for sure.